Depart home city for Bangkok. Meals aloft. Arrive at the Suvarnabhumi International Airport. After clearing security and customs, our representative will meet and transfer you to your hotel. Meals aloft. Explore this vibrant, bustling city by boat, cruising along the Chao Phraya River. Visit Wat Arun, Grand Palace, Temple of the Emerald Buddha and a private tour of the exquisite Jim Thompson House (a series of classic Thai houses he combined to make his home). His collection of Thai art and architecture is superb; the American entrepreneur was instrumental in reviving Thai silk weaving and promoting it to Western markets, where it remain popular today. The adjoining shop sells beautiful items in classic, sumptuous fabrics. We enjoy lunch at the cafe before our curator-led visit to the marvelous Queen Sirikit Museum of Textiles. Dinner at charming Mango Tree Restaurant. Fly to Luang Prabang, arrive mid day and transfer to our charging small, centrally-located hotel. Afternoon sightseeing in this laid-back lovely UNESCO World Heritage town with our local guide to visit the major temples and the Palace Museum. At 6 p.m., we enjoy a curator-led tour of The Arts and Ethnology Center (TAEC), a small but carefully curated collection of Laotian ethnic tribes, displaying classic clothing and day to day living implements. Dinner tonight at the Coconut Gardens. Today you'll enjoy a full day workshop at the renowned co-op Ock Pop Tok. Formed by Joanna Smith, an English photographer, and Veomanee Duangdala, a local weaver, their philosophy is to empower women through their traditional skills, as well as promote the beauty of Laotian textiles across the globe. Their mission is to follow the principles of fair-trade to advance the artistic, cultural and social development of Lao artisans and increase the appreciation of Lao's diverse textiles and communities through educational activities. 11 years later, the operation has grown and now consists of a master Weavers Studio at their Living Crafts Centre in Luang Prabang and a series of initiatives in villages known as the Village Weavers Project. OPT has been a presence at the Santa Fe International Folk Art Market for the past four years. This morning we'll learn about natural dyes and dye silk, using it for our afternoon weaving experience. Lunch is in their delightful cafe, on a blue overlooking the Mekong River. Dinner on your own, with suggestions from our guide and tour leader Emi. A 2 1/2 hr. drive through the countryside takes us to the scenic Tai Leu village of Ban Na Yang, where the weavers employ the tapestry technique in their weaving, using their fingers to interlace threads and create a pattern on a loom-woven textile. We'll see cotton production from start to finish and have a hands-on experience with traditional indigo dyes. A productive agriculture village, we'll see tobacco in the many drying houses dotting the village. The architecture of their traditional wooden houses is quite unique, and well-preserved. Lunch at the village. We'll return late afternoon to LP and you have the rest of the day free. This morning we visit the village of Ban Xangkhong to see paper being made by hand. We'll also visit several of the weaving shops and galleries, see the collection of a Tai Dam master weaver, and meet contemporary weaver Tadam, at her Patta Gallery. We'll enjoy local tea at Artisans du Mekong before boarding our private longtail boat for a cruise to the dramatic Kuangsi Waterfalls. Lunch is at the unique Vanvisa Guesthouse, overlooking the falls. We return to LP later this afternoon; dinner on your own. The entire day is free to enjoy the town, in one of the many coffee shops watching the world stroll by, having a massage at one of the local parlors or perhaps revisiting something you saw earlier in the trip. Tonight, Emi takes us to her favorite outdoor restaurant serving Lao-style barbecue, quite different than our own. Definitely no Tex-Mex here! We bid farewell to this charming town and board our private van to drive south to Vang Vieng, approximately 5 hrs., through classic Lao countryside. We'll stop for a bowl of noodle soup en route, before arriving at our lovely resort. It is located on the banks of the Nam Song River, in a tropical garden with swimming pool. There are beautiful views of rock and limestone mountains; the rooms feature original decor inspired by eight ethnic groups. Enjoy relaxing at the hotel before dinner this evening. After breakfast we drive about 2 hrs. to Saoban villages which specialize in silk and bamboo. Saoban is a craft organization, a member of PADTC, a Lao NGO that integrates socially sustainable programs in education, agriculture, micro-finance, handcrafts and community leadership.www.saobancrafts.com. We visit the silk village and have lunch here before our bamboo weaving workshop. Leaving the village, we drive 1 1/2 hrs. to the Lao capital city of Vientiane. Dinner at our comfortable, centrally-located hotel. Don't miss their gift shop, filled with Laotian crafts! Our guide will meet us after breakfast for a tour of this interesting town. We'll visit the fascinating morning market and Wat Sisiket, a temple quite different from what we have seen. After lunch at delicious Makphet, a restaurant founded by Friends-International in Vientiane in 2004, in partnership with the Ministry of Labor and Social Welfare to address the needs of street children and young people in Laos. The restaurant is rated #1 in Vientiane. This afternoon we visit COPE. a locally run non-profit organisation working with the Center of Medical Rehabilitation (CMR), Lao Ministry of Health and four provincial rehabilitation centres in an innovative partnership to provide comprehensive rehabilitation services for Unexploded Ordnance (UXO) survivors and other people with disabilities across Laos. Born of the unfortunate existence of land mines from the previous wars, this organization is so positive and uplifting and helps so many people in Laos. The visit is truly fascinating and enlightening. Dinner on your own. We have an 8 a.m. meeting with the famed textile artist Carol Cassidy at her studio, a renovated private villa. Her Lao Textiles is one of the first privately owned businesses in Laos, and her goal was to demonstrate the commercial viability of creating textiles based on tradition for a world market. She works with local craftswomen to produce high quality fibers that draw pun traditional motifs and colors combined in innovative ways. We reboard our private van and drive just outside town to the Houey Hong Vocational Centre. It provides training and employment for disadvantaged Lao women in natural dyeing, traditional Lao weaving, tailoring and small business administration-exciting prospects for women in this emerging economy. Their end products are handsome scarves, jackets, table mats and more. We have lunch here before enjoying a workshop of a special project our hostess has planned for us! Returning to Vientiane, your evening is free. Early departure for our flight south to Pakse, about 1 1/2 hrs. From the airport we drive through the famous Bolaven Plateau, located in an ancient volcano which erupted millions of years ago. It is green all year and at a high altitude, about 5,000, therefore cooler than the rest of Laos. We'll stop for a tour of a coffee plantation, finishing with a cup of their finest. We lunch here before continuing to Tad Lo village and our lodge. Today we visit the Katu weavers of Salavan, where a Japanese NGO, JICA, has been developing products with these weavers. They are known for weaving beads into the cloth in intricate patterns on backstrap looms. Originally the beads were animal bones. They also make beautiful textiles from banana fiber. We join the villagers for lunch and see how they weave cotton and banana fiber, and work with dyes for striking patterns. After breakfast we drive 1 1/2 hrs. back to Pakse airport to catch our mid day flight back to Bangkok. Arriving in Bangkok, we transfer to our hotel. The rest of the day and evening are free. The whole day is free you to explore the city, have a massage, shop, etc. Tonight we will enjoy a beautiful dinner river cruise to see the city by night, a beautiful finale to this marvelous journey. This morning we fly to Siem Reap and enjoy a private tour of the Artisan d'Angkor silk weaving atelier and shop (Cambodian silk comes in a rich variety of textures, motifs and coloration: phamung (silk fabric in plain color), chorebap (silk brocade), hÃ´l (silk with colorful patterns) and hÃ´l lboeuk (hÃ´l combined with a brocade fabric. The company promotes fair and sustainable development to provide benefits to the rural communities. We'll lunch at The Square 24 Restaurant, featuring excellent Khmer cuisine. We enjoy the afternoon visiting the excellent Angkor National Museum, filled with a unique collation of art objects from the ancient Khmer kingdom; this visit will enhance and enrich our tour tomorrow of the stunning ruins of Angkor Wat. We continue with a visit to Wat Thmie, a modern day pagoda (1992) in contrast with the ancient sandstone of Angkor Wat (1113-40). Dinner on our own. We might want to venture out to the colorful and bustling night market! 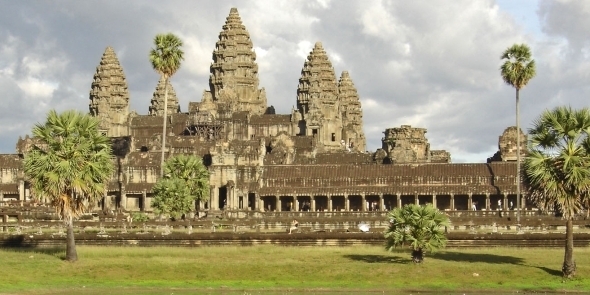 Enjoy a full day touring the south gate of Angkor Theom, Bayon, Baphoun, the Terrace of the Elephant and Leper King and the startling Ta Prohm Temple, still engulfed by the roots of centuries-old trees, made famous by "Indiana Jones". After lunch we visit the stunning Angkor Wat. Tonight we'll enjoy dinner at the hotel. The morning is free for your enjoyment before transferring to the airport for the afternoon flight to Bangkok. We transfer to our hotel and prepare for our farewell dinner cruise to see the city by night, a beautiful finale to this marvelous journey. All special meetings, receptions, etc. PLEASE NOTE: both the Laos & Thai main trip and the extension to Angkor Wat itinerary content, pacing, hotels, etc. all subject to change due to circumstances beyond our control. We strive to provide equal or better replacements. Please understand we are traveling to out-of-the-way destinations. Flexibility and a sense of humor required!